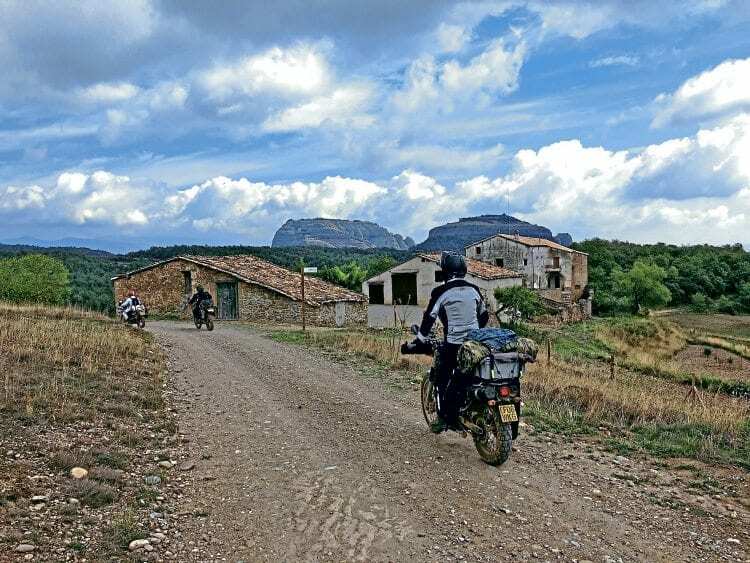 If you’re dreaming of a round-the-world motorcycle adventure, but don’t know how to get started, a Mini Mondo trip will set you on the right track. It’s difficult not to feel small in a setting like this – even when you’re thrashing around on a big adventure bike. 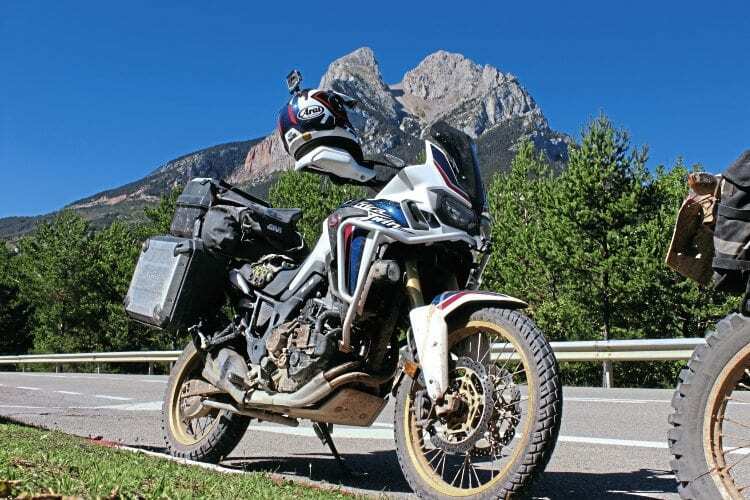 Travelling the world on a motorcycle, rough camping in the wild, and living every moment to the full is the stuff that all budding adventure riders dream about. But setting off on your own major biking adventure takes skill, knowledge and experience even before you ride the first mile. So, where do you go for tips on how to get started? 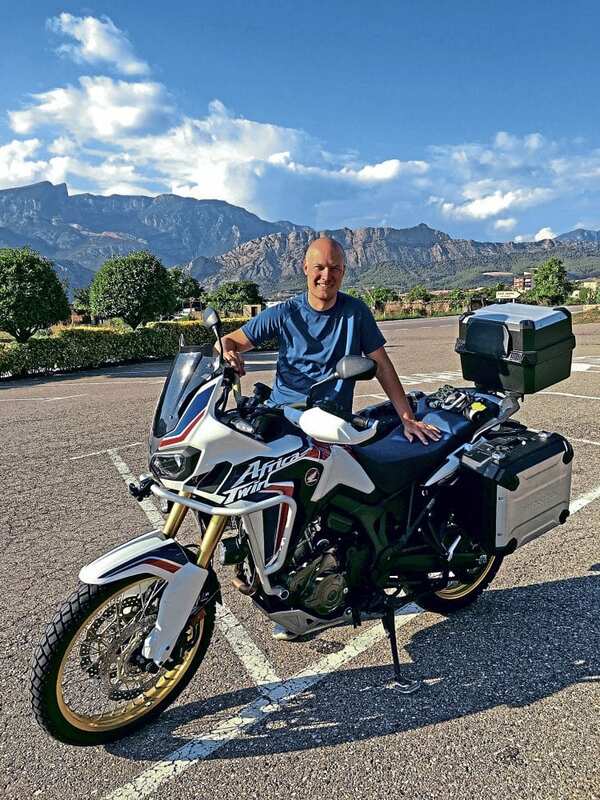 How about a Mini Mondo trip to the Spanish Pyrenees with long-distance motorcycle traveller, film-maker and all-round adventure expert Austin Vince? 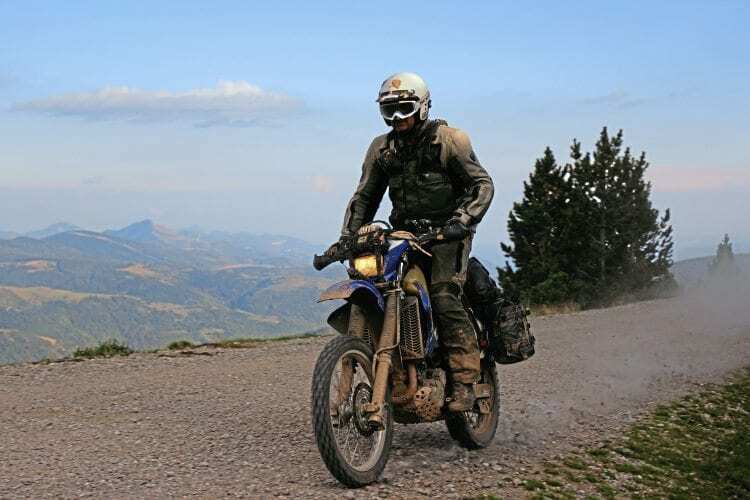 Mini Mondo is a five-day trail riding, rough camping and team-building exercise in the breath-taking natural wilderness of the Pyrenees. 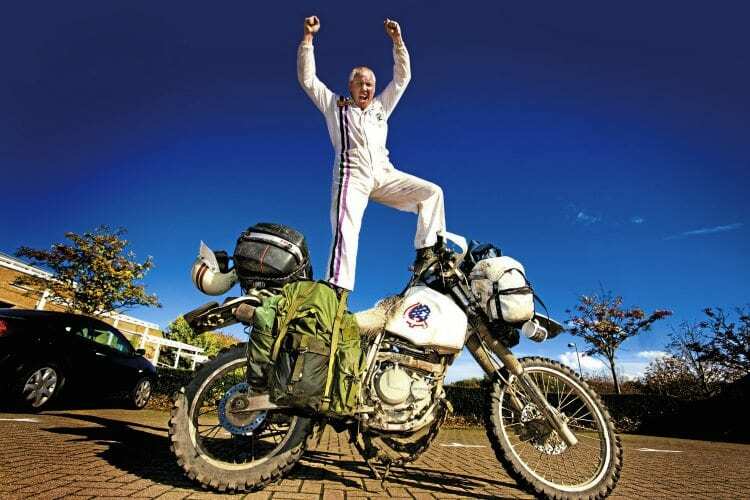 The trip simulates the conditions that Austin and his travelling buddies found on Mondo Enduro, a 440-day round-the-world motorcycle trip that was turned into a documentary film of the same name. Loading the bikes and making last minute preparations before we set off into the unknown wilderness of the Spanish Pyrenees. 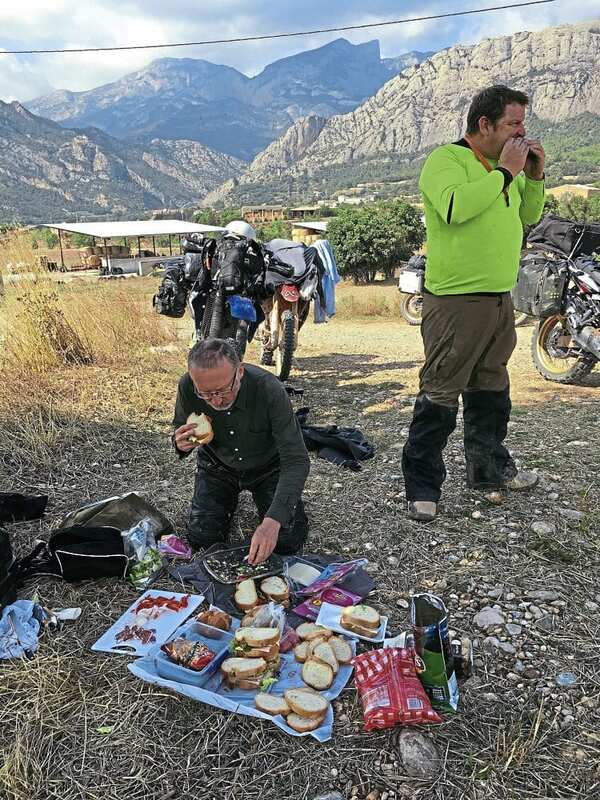 Austin and his co-leader for the trip, Dai Jones, have spent years in the Pyrenees, finding the most amazing network of connected trails, which means that on Mini Mondo you only spend a fraction of the time on Tarmac, maximising the off-road riding experience. Before the storm: man and bike ready for adventure at the base camp in Oliana, Spain. 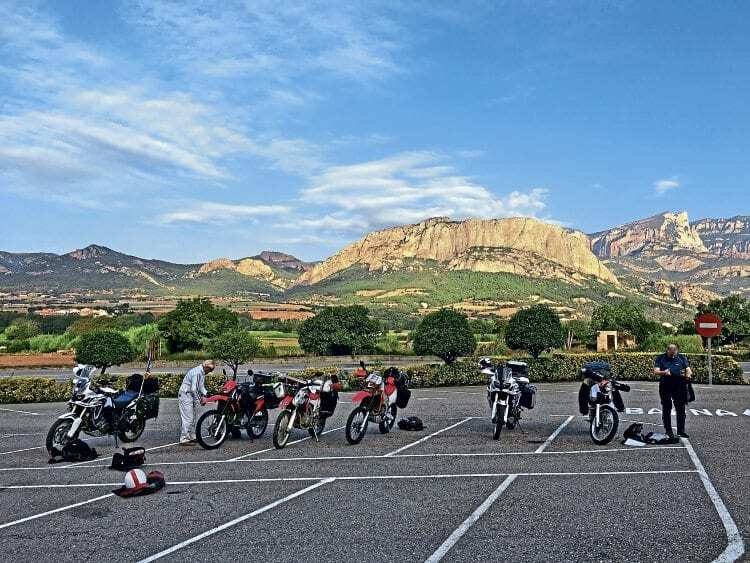 The trip is all about preparing people for their own adventures, not just razzing around on the Spanish trails, although they are excellent, and certainly add to the enjoyment. The most important lessons from Mini Mondo are teamwork skills and the ability to look after yourself and others in challenging locations and situations. 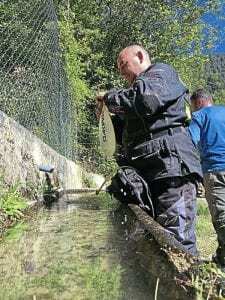 Apart from what I had read online, and the instructions telling me what kit to bring, I didn’t know much about Mini Mondo as I arrived at Hotel Cal Petit, our meeting point in Oliana in the Spanish Pyrenees, just south of the Andorran border. I had crossed the Channel by Brittany Ferries from Portsmouth to Caen, and had a couple of days of riding through France and Andorra to get there. A lovely leisurely start to the trip. The emphasis of Mini Mondo is on teamwork but some of the riding took real effort and concentration too. I was on the Honda CRF1000L DCT Africa Twin; a big, capable 998cc parallel twin with 94bhp of power and 721b-ft of torque, just dripping with adventure spirit. All I knew was that I was going to be riding the machine on some amazing trails, camping rough amid the stunning mountain scenery, and spending the next five days in very close quarters with seven other guys. I didn’t know it yet, but I was about to have one of the most intense and satisfying experiences of my life. At the hotel, I went to the reception and asked for a room booked under my name. I was faced with silence and a quizzical look. I tried to explain that I was part of the Mini Mondo group, with Austin Vince. That seemed to hit a chord with the receptionist: “You sleep with Austin Vince?” she asked cheerily. Austin and Dai know the Pyrenees like the backs of their hands, but at times even they had to check they were on the right track. Our group gathered for the initial briefing in the evening, where Austin explained what we were going to be doing over the next few days. We would be riding from Oliana to Mollo – some 350 miles – almost entirely on trails, wild-camping on the way. We would only leave the wilderness to buy food and petrol. To all intents and purposes we would be living off the grid, to simulate travelling across less-developed areas of the world. 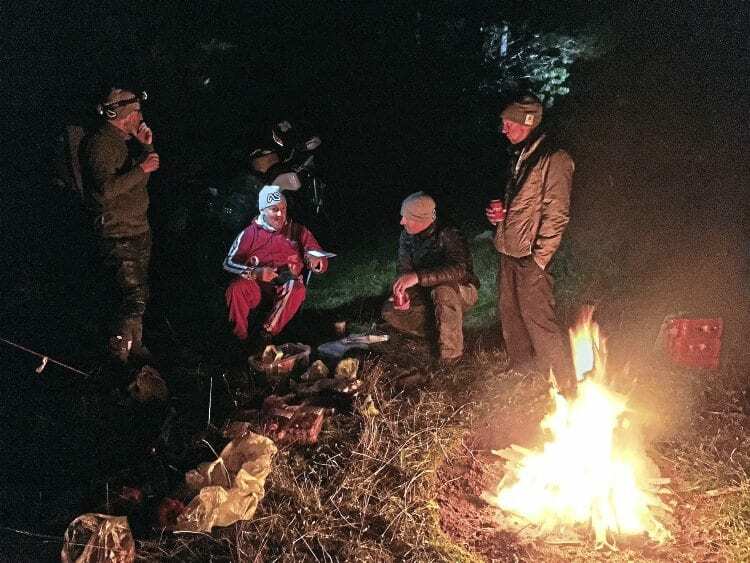 Working as a team meant that all the shared equipment – from water containers to food, saucepans to the washing-up kit – was divided between the riders to carry, and we had a rota of jobs such as cooking, washing-up and getting the campfire going, that we were responsible for. We were then allocated our tarps in case it rained at night (no tents, just sleeping bags, bivvy bags and tarps if needed), whistles in case of an emergency and Mini Mondo woolly hats. There were moments when the team took off-roading a bit too literally. It took an Africa Twin and four blokes to drag the Suzuki back onto the road. While Austin explained the basics, I stole a glance at the bikes and realised that the majority of them were small, nimble-looking dirt bikes: a Honda CRF250, a Beta Alp 4.0, a Honda XR650R, a Suzuki DZ-R and a Honda Tornado. But comfortingly, there were two other Africa Twins (a DCT model like mine and a geared version). I wasn’t alone with the big beast after all! Most of the bikes had soft luggage and knobbly tyres. Only mine and another Africa Twin sported hard luggage and dual-purpose tyres (mine being the Honda hard luggage set and Pirelli Scorpion MT90 A/T tyres). Austin wasn’t impressed with my panniers: “If they last the week. I’ll be amazed!” he offered. 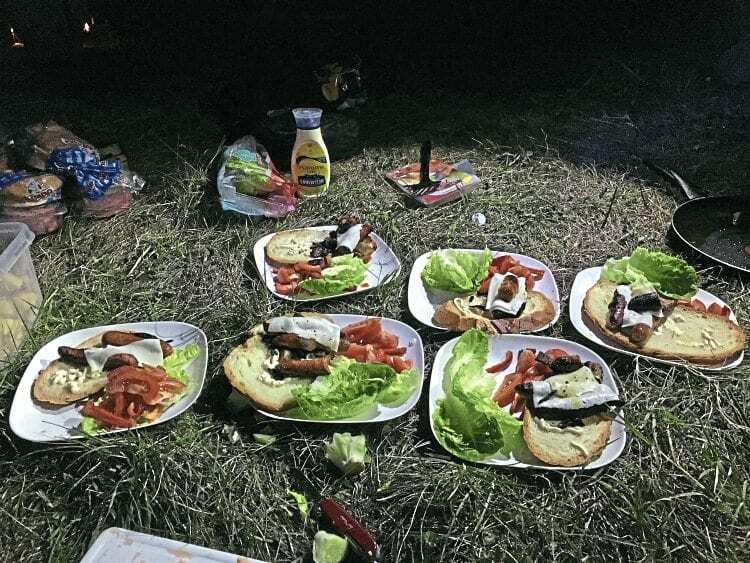 Cow pats to the left, sandwiches to the right; picnic lunches are the way to go. Had I completely misunderstood the kind of riding we were going to embark on? How difficult were these trails going to be? I had imagined easy-going dirt tracks that big adventure bikes would be able to just shrug off. This could be very interesting. In the morning, we set off for a shakedown ride — a couple of hours of riding along local trails to get us into the groove. After that we’d head out to the wilderness, where there would be no support vehicle, no medics on stand-by or anyone else we could rely on. We would be on our own. The shakedown route started exactly as I had expected, with a small stretch of Tarmac to reach a dirt road, and then gentle bends, easy hills and generally a jolly good simple ride. The sun was out, it was 20°C and there was a light breeze to keep us cool. Perfect conditions. 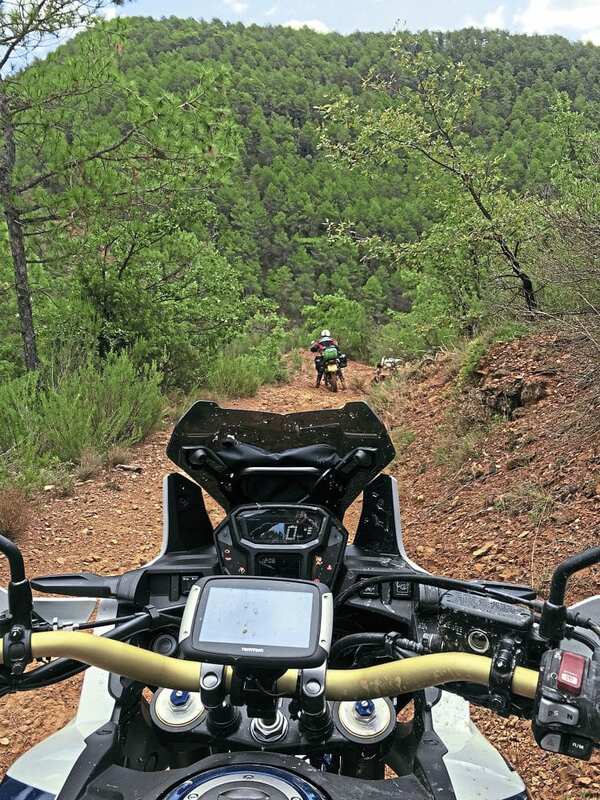 The Pyrenees spoil you when it comes to trail riding. From nice and easy fire tracks to muddy ruts and rocky hill climbs, these mountains have it all. After the first couple of miles, the going got a bit tougher, with a few wet areas where the road had turned into muddy ruts. 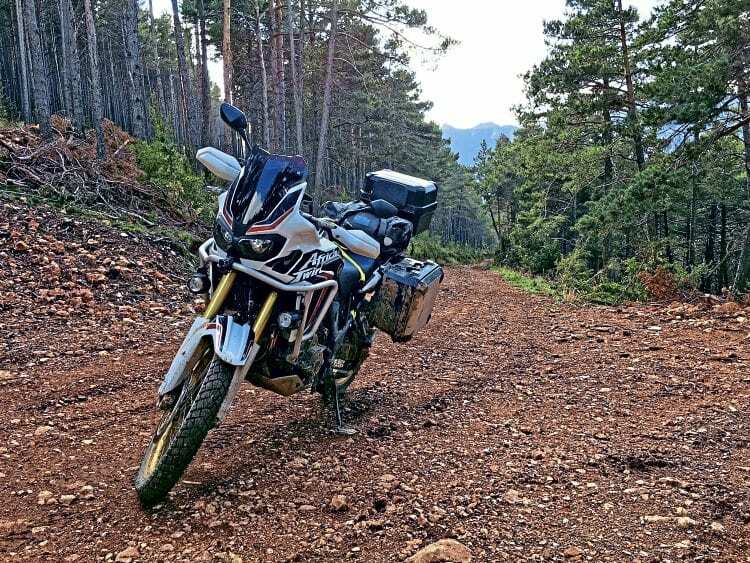 This was nothing particularly challenging for experienced off-road riders on light bikes with knobblies on, but for me, on the Africa Twin, and with dual-purpose tyres, it was testing to say the least. I managed to slide through the first couple of puddles, but then in a particularly deep rut, I lost the front and fell straight into the mud. A little further along, the route started to get more technical, even without being muddy. The track took a rockier guise, and I really needed to work to keep the Africa Twin shiny side up. I didn’t manage it for long. On a narrow and rocky decline I lost the front again, but this time there was no soft mud to soften the blow. The three amigos: Austin, Jonathan and Matt (left to right) strike an adventure pose. As I got up and saw the bike on its side, it was clear that Austin’s prophesy of the panniers not lasting the week had already come true. The right pannier had lost one of its mounts in the crash, and was now a few yards away with a big hole in the side. We managed to secure it to the bike with a strap, but it was clearly on borrowed time. 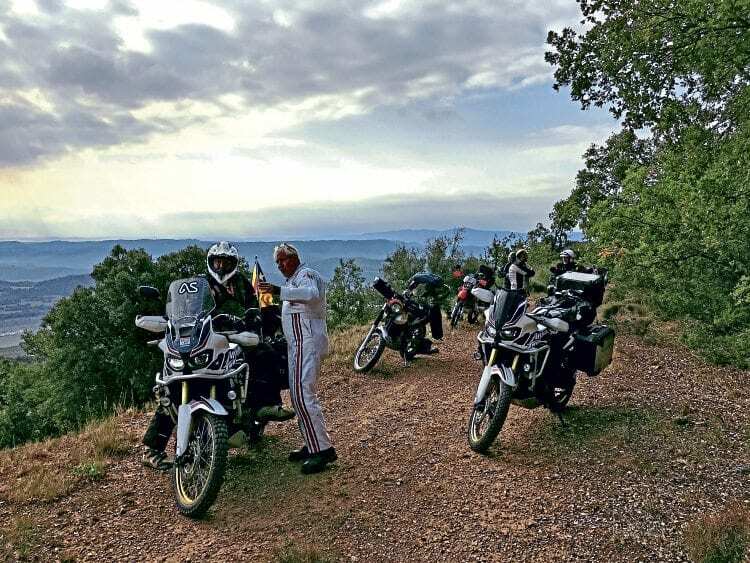 Apart from Austin and Dai, everyone got more closely acquainted with the Spanish soil during the shakedown ride – some several times. We stopped for some lunch after a couple of hours, nursing the first bruises of the trip, but determined not to let the trails get the better of us. As we rode off in search of our first camping place, I decided to up my game as quickly as possible, to make the most of the next few days of riding. The tyres and panniers I could do nothing about, so instead I would work on my skills and get to know the bike as best I could. It was instantly obvious that the DCT (Dual Clutch Transmission, or automatic, if you like) system suited my off-road riding. I didn’t have loads of experience, so not having to worry about stalling the bike was a clear benefit from the start. I still opted to use the manual setting rather than the fully automatic mode, to allow full control of the gears through the paddles on the left handlebar. There are hundreds of miles of excellent tracks and paths in the Pyrenees. The tricky bit is finding and combining them into a continuous route. The rest of the day’s riding turned out to be much easier than the initial shakedown. I was getting my confidence back and started to have a better feel for how the bike handled. I quickly realised that the Honda was sure-footed and planted as long as I didn’t do anything too rash to upset the balance and risk the tyres losing grip. Our first makeshift campsite was on the grounds of an abandoned farmhouse. We arrived at dusk, and quickly set about putting up the tarps in between the bikes, lighting a fire for cooking, and preparing food. Everyone had their specific jobs to do, clearly marked in the rota, so there was no slacking – we all had to pull our weight. The genius of rough camping; you can do it with a minimal amount of equipment. As this was the first time we were in action, the jobs didn’t come naturally. I found myself cooking, initially in fading light and later in complete darkness, with just the fire and a torch to help me see what I was doing. Austin’s advice had been: “This is bachelor cooking, guys: throw all the spices in there, nobody knows which one it is that makes it taste good.” We followed his lead, and it worked; the food tasted great, or maybe everyone was just so hungry after the first full day of riding that we could have served anything. Rough glamping – a roaring fire, hot food and tall tales of adventure are all you need for a good night. That, and a good sleeping bag. Spending the first night in the wild was special. As we had no tents, we could see the clear starry sky from our sleeping bags, and it took a while before I could let go of the spectacular view of the Milky Way stretching across the sky above us. In the end, the excitement of the day took its toll, and the next thing I knew, my alarm was telling me to get up and get some coffees brewing for the team. The mountains are littered with ruined old farms, proving great rough camping spots for adventure-seekers. The next two days were spent in trail-riding and wild-camping nirvana. We got into a slick routine of setting up the camp at night, cooking, clearing up and having a chat by the fire before retiring to the warmth of our sleeping bags. In the morning the coffees and breakfast were made, eaten and cleared up before sunrise. Despite all that, we left no trace of our presence behind – nobody would know that eight blokes with bikes had just spent the night there. There’s something addictive about waking up every morning in the most gorgeous settings you can imagine, knowing you’ll be spending the day riding some amazing trails. The camping spots were spectacular, especially our second night at what Austin called the ‘Eagle’s Nest’: a clearing at the top of a mountain with a sheer drop of hundreds of metres and spectacular views of the surrounding hills, woods and villages in the distance. Without wild camping you’d probably have to be a wealthy Spanish landowner to get a view like this. Adventure bikes made for great drying racks when your camping kit is wet. The trails were a mixture of easy, technical, and on odd occasions, slightly terrifying. 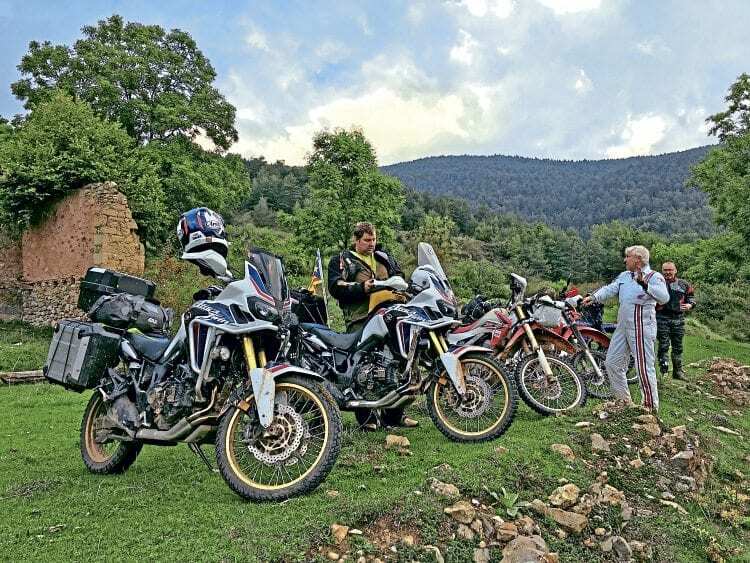 And even though there were detours around the trickier paths, it’s safe to say that you need to be a confident rider to take part on this trip and not hold the others back. I felt like my riding improved enormously over the five days. I was getting used to the stony trails, the big hills and the Africa Twin. The bike had really impressed me. I had done a bit of off-roading on it before the trip, so I knew it was a capable machine on the trails, but the more I rode it, the more I grew to appreciate the huge amount of torque on offer, the surprisingly good balance and the high perch from where I could see all the obstacles in my way. The bike did have its downsides too. Most of them became obvious when I dropped it. First of all, it’s a pain (in the most literal sense possible) to pick up. You can just about do it by yourself, but it’s not easy. 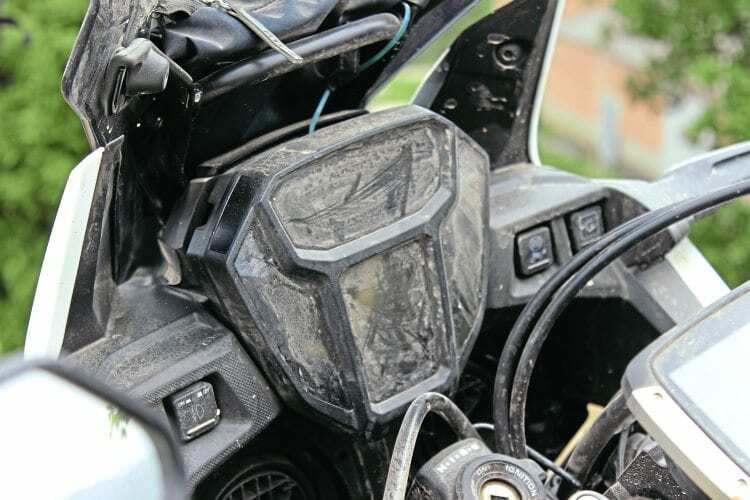 Second, without sturdy aftermarket protectors, bigger tumbles also meant some damage to the bike: by the end of the week, both panniers were smashed to pieces in rocky sections of the trails, the fog lights looked rather cross-eyed, one of the hand guards was missing, and the left rear panel had taken off with the pannier. The sticks and stones of the Pyrenees could not hurt my Africa Twin, but they did give it a good scratch. There were also scrapes and bumps on the exhaust and engine casing, and the number plate was held in place with cable ties. But despite all the knocks that the bike had taken, it was still performing to the full, not missing a beat, and starting first time whenever I picked it up from a hedge, puddle or ditch. 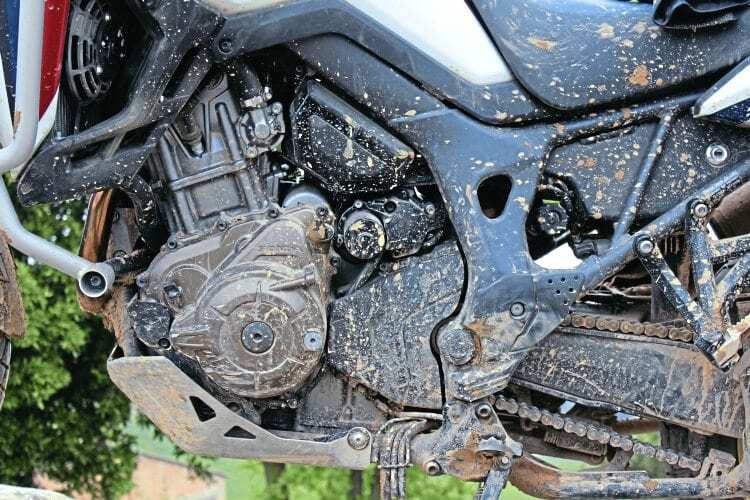 In the mud and mire: spoked wheels are standard on the Africa Twin – tougher than cast alloy, which is great when hitting rocks. To protect the Honda from most of the damage that I managed to inflict on it, you’d need a bigger, sturdier belly pan that also covers the header pipes, heavy-duty crash bars to stop the engine casing and the plastic panels taking a beating, and of course, as Austin had already pointed out, soft luggage. Naturally, better off-roading skills would keep you out of trouble in the first place, but I didn’t have that luxury. 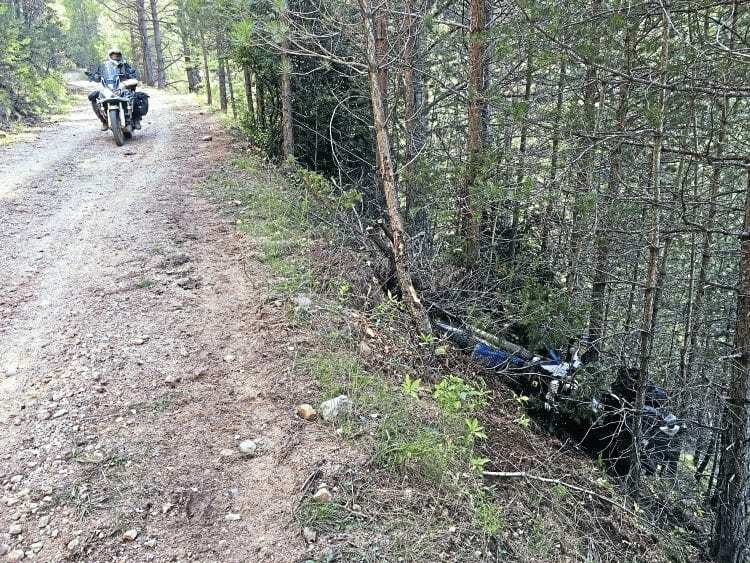 This is where the pannier was – right until crash number four. Hard luggage turned out to be an expensive choice. 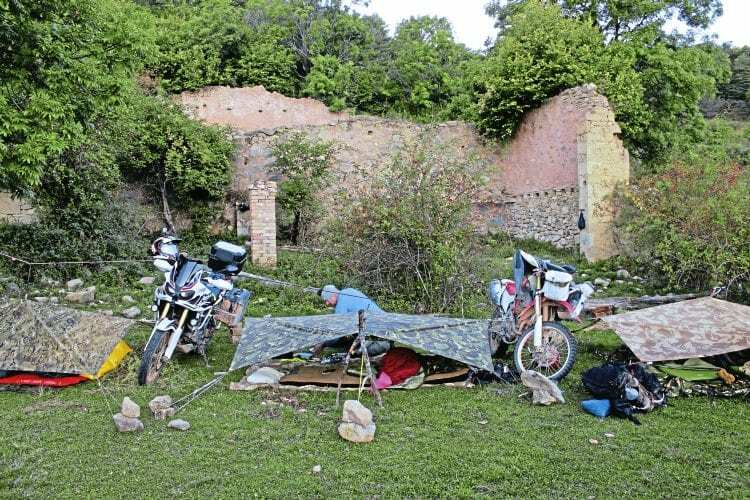 By the time we gathered at our final camping spot – another abandoned farm – the team was working like a well-oiled machine (which is more than could be said about some of the bikes). Everyone knew their jobs, and got on with them efficiently and without a grumble. We had the camp set up and a delicious meal in front of us before we knew it. It was strange how quickly you got used to the routine, and with the team working together it didn’t seem like a chore at all. It felt almost alien to think that tomorrow night we’d be back in civilisation. Although, in all honesty, I was ready for a shower. A key part of Mini Mondo is to cook proper meals. No ration packs here, thank you very much! One of the things that Austin had been clear about from the start was that all food would be fresh; there would be no ready-meals, ration packs or processed stuff. And it would all be cooked on the campfire, not gas cookers. At first this sounded like an unnecessary complication, but by the end of the trip it was effortless, and a lot tastier than dried food. Another revelation had been not using tents. Seeing the starry skies from your sleeping bag was amazing, and added to the feel of being somewhere remote, off the grid. Our final day of riding took us to the village of Mollo, where we had a hotel booked for the last night of the journey. It was time to reflect on what we had done, learnt, and achieved. Lunch stop in the foothills of the fork-shaped Pedraforca mountain. For me, the sheer amount of knowledge that Austin and Dai shared with us was priceless. Every little detail mattered, from specific ways of securing the tarps to having set jobs for everyone. Individually, these things were all relatively small and seemingly insignificant, but put them all together and they could make or break your adventure. 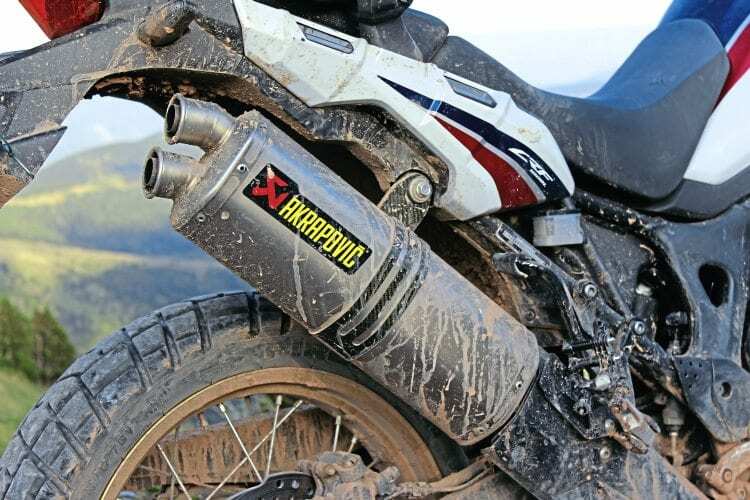 The Akrapovic end can is much lighter than the original – and it sounds awesome (even when it’s a bit dented). Incidentally, Austin kept calling our trip a holiday rather than an adventure. And he had a point; we were still in the heart of Europe, even if the Pyrenees hid us from urban life well. But to anyone who hasn’t travelled through remote wastelands or the tropics, this was as close to a wild adventure as you can get. 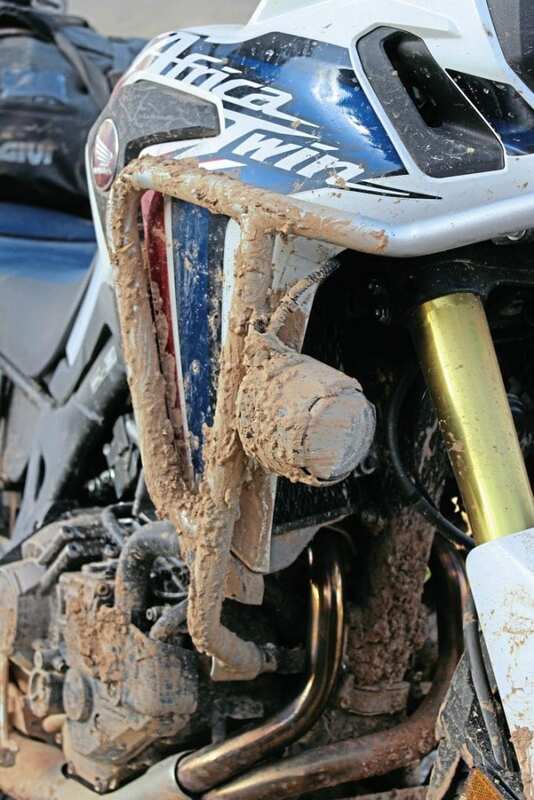 Muddy good fun – a couple of spills in the ruts gave the Africa Twin that adventure look. Whether I’ll go and have my own ‘big adventure’ I don’t know. I feel like I’ve had my eyes opened to what it could be like, and I feel like it could be done, but for the moment I’m happy to just go away for a week or two at a time. But one thing is for sure, my next wild camping trip to Scotland will look a lot different to previous ones. 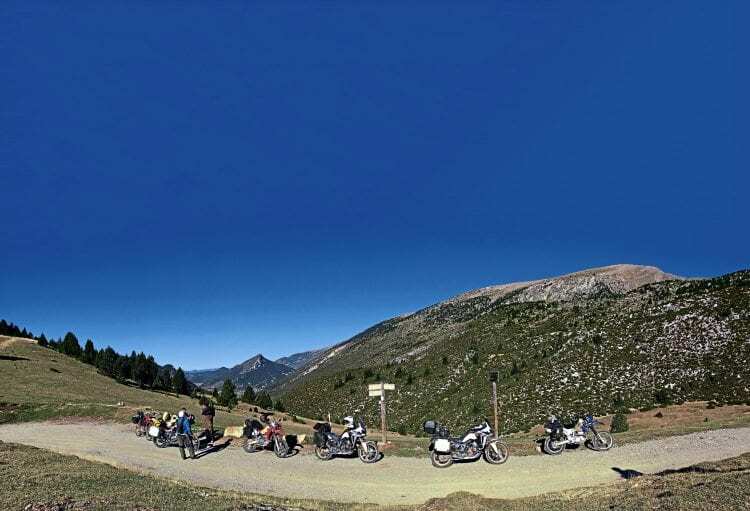 Mini Mondo is a five-day guided trail ride and wild camping trip around the Pyrenees. The trip is designed for people who want a bit of an adventure but can only get a week off, or to those who want to embark on their own adventure but don’t know where to start. 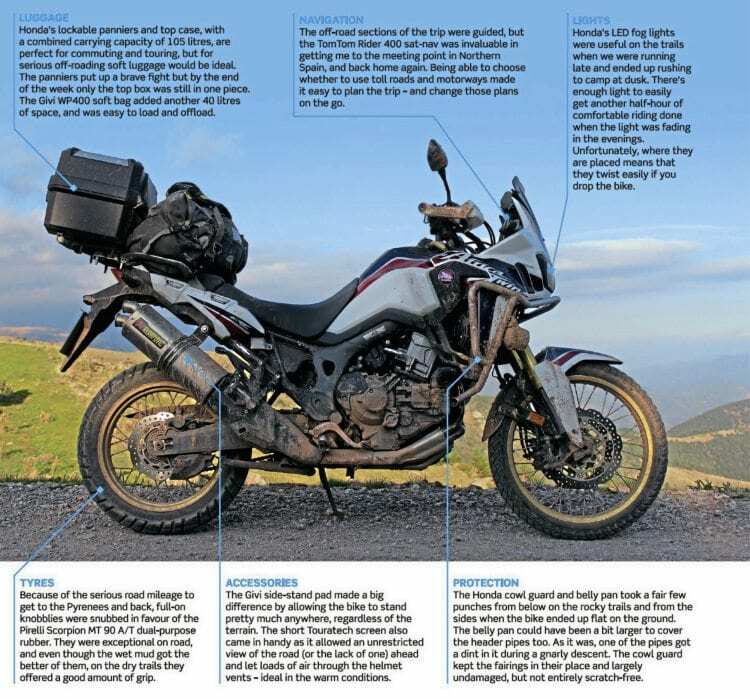 It’s basically an introduction to adventure riding and travel. The thin exhaust guard is largely ornamental. An aftermarket sump guard protecting the pipe would be worth its weight in gold. The trip is all about teamwork, self-catering and rough camping with only tarps for cover. There are not tents, GPS, back-up vehicle, mechanical recovery or satellite phones. If you like your creature comforts and hotels, this is not for you. But if you are looking for adventure, head this way! There’s nothing quite like Mini Mondo out there, so we spoke to the man behind the idea, Austin Vince, to get his view on what Mini Mondo really is. MSL: How did Mini Mondo come to life? AV: I was distressed at how many sane, productive, high-functioning people would say to me at events that they’d love to go for an adventure, but didn’t know how to go about it. I had spent 10 years researching the Pyrenees off-road, so I thought, why don’t I create an excerpt of the last third of Mondo-Enduro from Johannesburg to London, when we operated as an incredibly selfless, high-functioning team who knew by then exactly what they were doing. 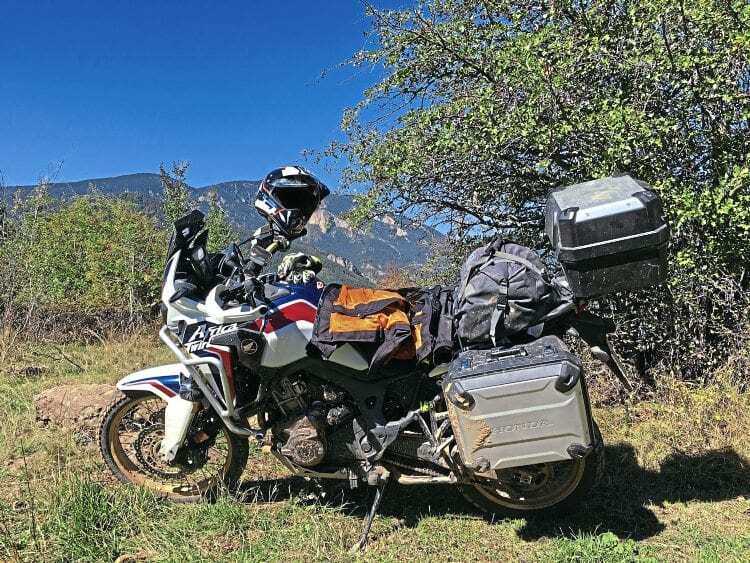 For example, we started Mondo-Enduro with three tents, but 10 months into it there were no tents; we started with five out of seven bikes having hard luggage, but by the end of it nobody had hard luggage. We had this shakedown that lasted 10 months, and by the end of it we were pretty slick. So there’s all this experience that can’t be gained in weeks or months, it’s gained over years. I wanted to pass that on. 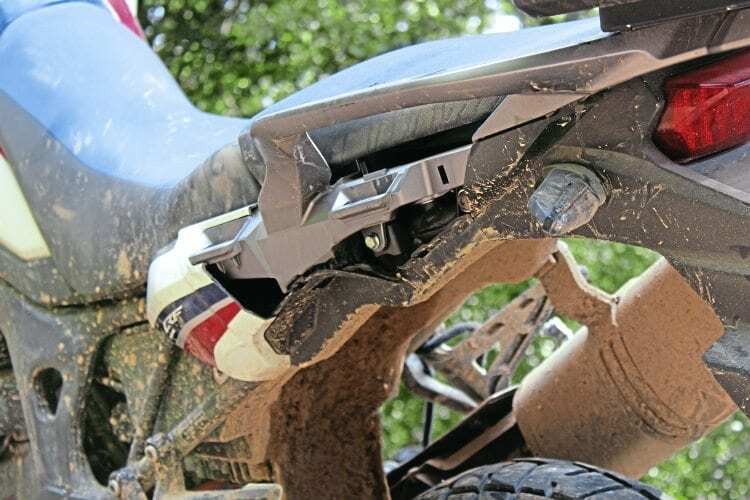 MSL: What makes Mini Mondo stand out from other trail-riding trips? AV: All we’ve done with Mini Mondo is take some guys trail riding and rough camping. Now, that doesn’t sound very clever or revolutionary, but the key features that make it stand out are, firstly, a sensation that we are expected to be self-sufficient and autonomous. The idea of somebody following us and helping in case something goes wrong is absolutely unacceptable. Not because it’s a bad idea but because I’m trying to prepare people for independent long-distance travel, and I’m trying to demonstrate that you have more fun without a support vehicle than the fun you have with a support vehicle. Secondly, I think you have more fun crouched down with a head-torch, chopping up food with all these other guys who become your friends than sitting at a restaurant saying ‘I’ll have the steak please’. We’re not living rough, we’re living real. We’re not hard done by, we’re kings. We’re sleeping in places where you’d ordinarily have to be a millionaire to have that view. And we just rolled up and made it ours for the night. MSL: What’s with the tarps instead of tents? AV: I’m not anti-tent, I’m just pro-tarp. And I’m pro sleeping outside. Not because I want hardship – I love comfort – but if you’re going to go outside, why would you put yourself in a nylon box for eight hours a night? Wherever you wake up in the world, the Sahara, Mexico, India or Siberia, when you wake up in a tent it looks the same in the morning. It’s the weirdest thing. It’s the same as someone travelling around the world and refusing to eat anywhere but McDonalds. I want to wake up and see the stars, not a nylon ceiling. MSL: Who is it for? AV: The person I want to come and do Mini Mondo is someone who would like to do a big trip around the world with their mates, but they’re not quite sure where to start. They know how to ride a motorbike, they’ve done a bit of off-roading, and now they want to do a long trip to somewhere like Johannesburg or Vladivostok. This is your training week for a big trip. Teamwork is at the heart of Mini Mondo. It’s for someone who thinks they’ll appreciate a completely immersive experience, where they’ll surrender their personal agenda for the benefit of the team. For five days you’re a member of Mini Mondo, where we don’t have our own time – there’s a list that tells everyone what their jobs are – after that you can go back to doing your own thing. This project uses trail riding as its medium, so if you’re not a vaguely experienced trail rider, you can’t take part in this properly. Worse than that, you’ll compromise the enjoyment of the other riders, because everyone will be waiting for you, and there will be certain routes that the group can’t go on because you can’t cope with it. You don’t have to be an expert, but you have to be a competent trail rider. MSL: What do you learn on Mini Mondo? AV: I’m trying to set people up with a template of a philosophy. A template of a rhythm of life, that I think works. It’s not for me to say that it works or it’s the only way, but it’s a way that has worked for me and my friends, and now I’m just putting it out there. 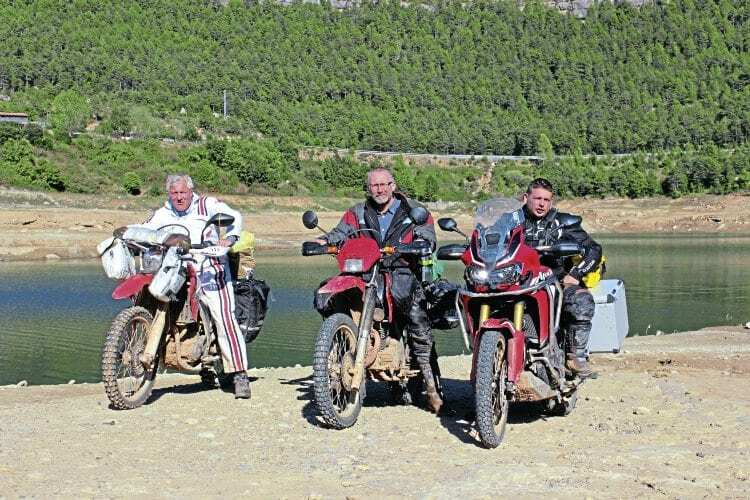 The offer is unique; nobody else is offering this kind of trial run of adventure motorcycling. Mini Mondo is not an adventure, it’s a holiday that prepares you for your own adventure. I’m trying to prepare evangelists or salespeople who will go away with the simple experience we’ve had here, with the skills they’ve picked up, who will say ‘hey everyone, why don’t we get some stuff together and go for a road trip, rough camp, light a fire and see where we end up?’ Maybe just ride from London to Marseilles on the backroads and rough camp on the way? I would be so thrilled if some of these guys did that. MSL: What made you choose this trip? CS: I wanted to gain some confidence in doing these kinds of trips on my own. I had heard a bit about Austin beforehand, and he seemed to be the one to learn from. I also figured that the people who signed up for the course would be like-minded, easy to get on with, and I’d probably learn a lot from them too. It sounded like a bit of challenge, and I think you have to have some challenges in life. MSL: What appealed to you about the Mini Mondo? CS: It was the whole concept. Everyone told me that trail riding in the Pyrenees was great, and it wasn’t too far from home. I also love living outdoors, and if I do longer trips on my own, I’ll need the skills to survive out in the wild, so it was the whole learning experience that was appealing. MSL: Was the trip as you’d expected? CS: I didn’t really know what to expect – that was the exciting thing about it. There wasn’t really an itinerary as such, just instructions of what to bring and where to meet. The whole thing was a bit nerve-racking, but you had to step up to the plate to do it, so it was like a big adventure from the start. MSL: Was there a particular high point? CS: Strangely, one of the best points was when we pulled up at the shops, and there were only three of us to get the food for the night and the morning. We came out of the supermarket with two full trolleys, looked at the bikes and thought, how on earth are we going to get all that on the bikes? We were just wedging food everywhere, and I ended up with two five-litre containers hung around my neck. Then we had to ride back to the camp. So the highlight was riding to the camp, off-road, balancing with all the stuff on the bikes – just that simple ride from the shops, loading the bike with stuff I didn’t even think it would carry, but it all went in somewhere. MSL: Did you enjoy the riding? CS: It was better than I had expected. I do a lot of green-laning, which tends to be a lot of short routes, and then you’re on roads again. I also ride a lot in the winter when it’s muddy, so over here it was nice not to have the mud. The riding was quite varied and I was surprised how fast you climb up a mountain on a bike – a couple of steep climbs and you’re up to 1000m. It was also nice that you could use your own bike on this trip, rather than a hire bike. I know my bike and trust it, so for me it makes the riding more enjoyable. That was part of the reason I chose this trip. MSL: Any plans for adventures of your own? CS: This was a great experience, and now I’d like to come back here and explore the trails with my friends. I sailed from Portsmouth to Caen with Brittany Ferries, and added a bit of touring in the mix by riding across France to reach the Pyrenees. After Mini Mondo I enjoyed a bit more of the excellent Spanish roads and sailed back from Santander to Portsmouth, again with Brittany Ferries. I had a nice, clean and spacious cabin on both journeys, and the ferries were a great place to relax in between all the riding. They had restaurants, shops and cinemas, but on the way back I was so wiped out I just enjoyed the comfy bed and slept 12 hours straight. With the cabins and the bike, the total cost of both crossings came to £317. For further information or to book, visit www.brittany-ferries.co.uk or call 0330 159 7000.